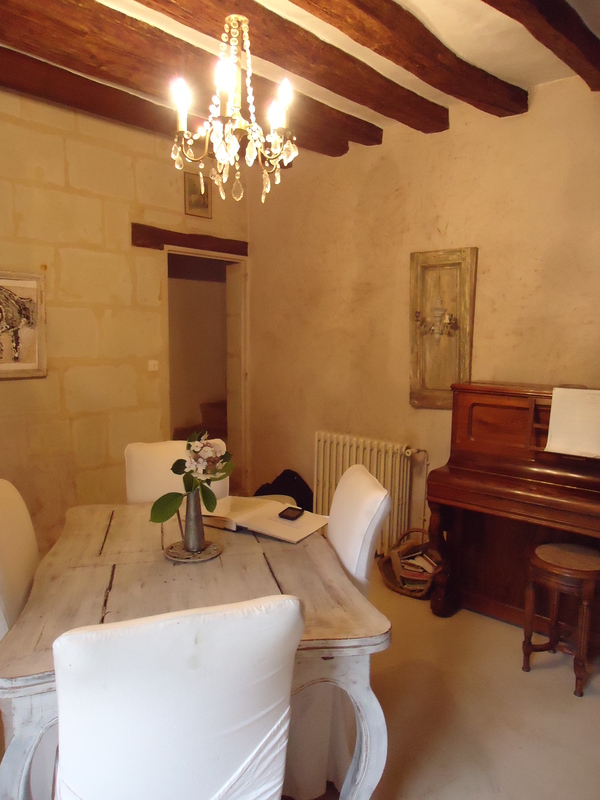 This 16th century dependent of Chateau Milly is a holiday rental. It was actually less expensive to rent than a weekly rental at the beach! 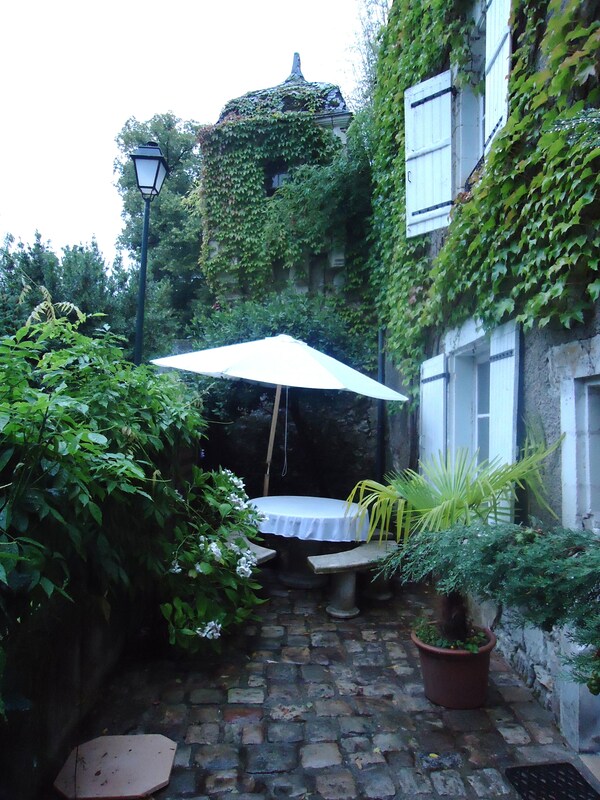 The owner, Monsieur Chalamet, was surprised when we rented it last year since we were the first Americans to do so. Of course, getting there involved a plane, train and rental car but it was worth it! 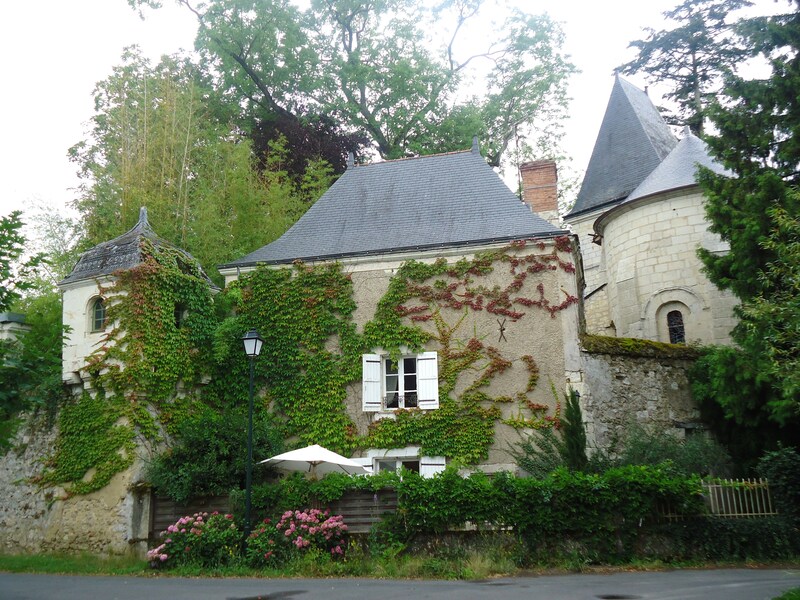 If you are going to tour chateaus in the Loire Valley, this is an enchanting place to stay. The only problem was that it was so enchanting that we had a hard time leaving in the morning to see the sights. 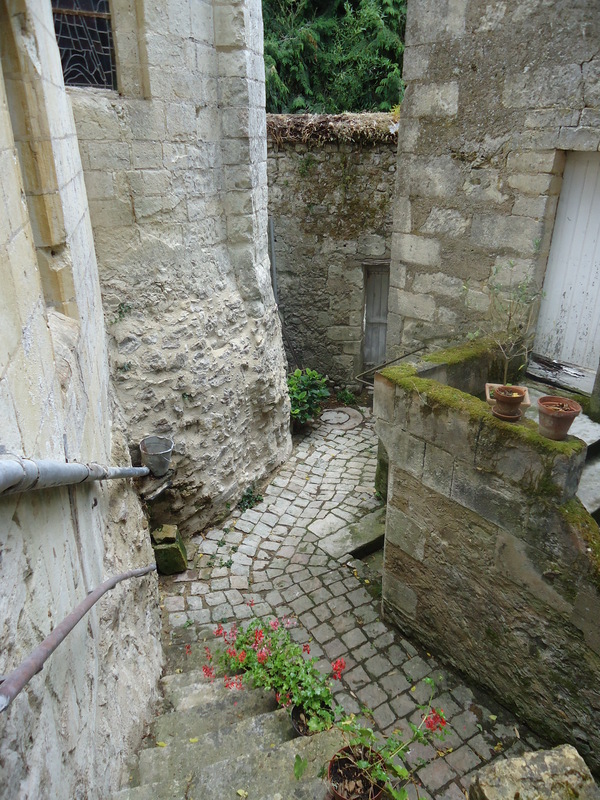 The dependent “Little Milly” shares a wall with Chateau Milly, which you can see to the left next to the tower. Little Milly is also attached to a Catholic church to the right—all built in the 16th century. 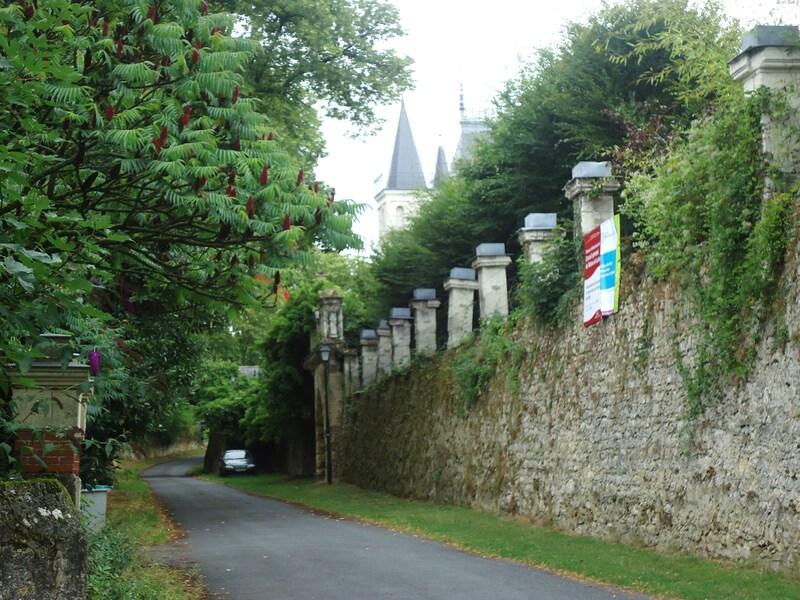 This is the wall surrounding Chateau Milly’s little hamlet of old limestone houses and farms. 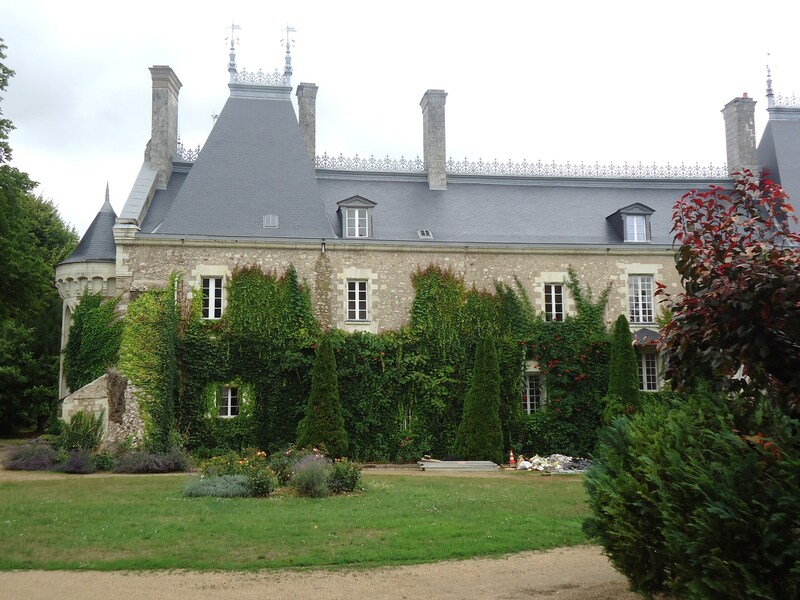 Chateau Milly from the 16th century and yes, a family actually lives here! They open the gardens to the public every Sunday. 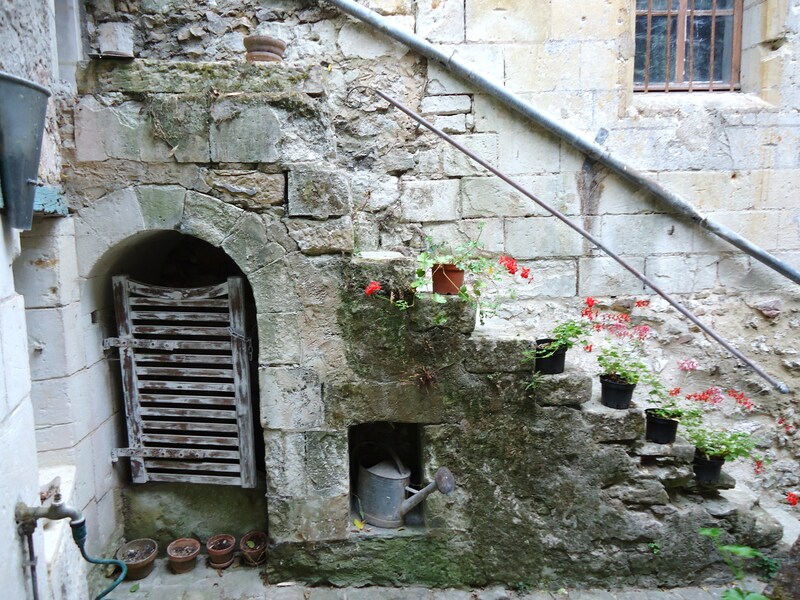 The front courtyard of the dependent “Little Milly”. The front door. I just adore the curtain with its little tassel. 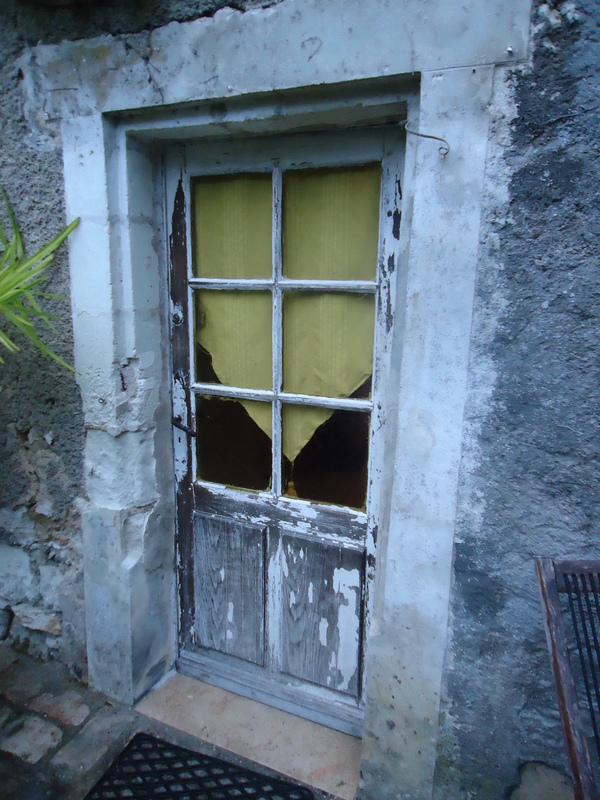 This style of window treatment is very popular in France. It is everywhere. 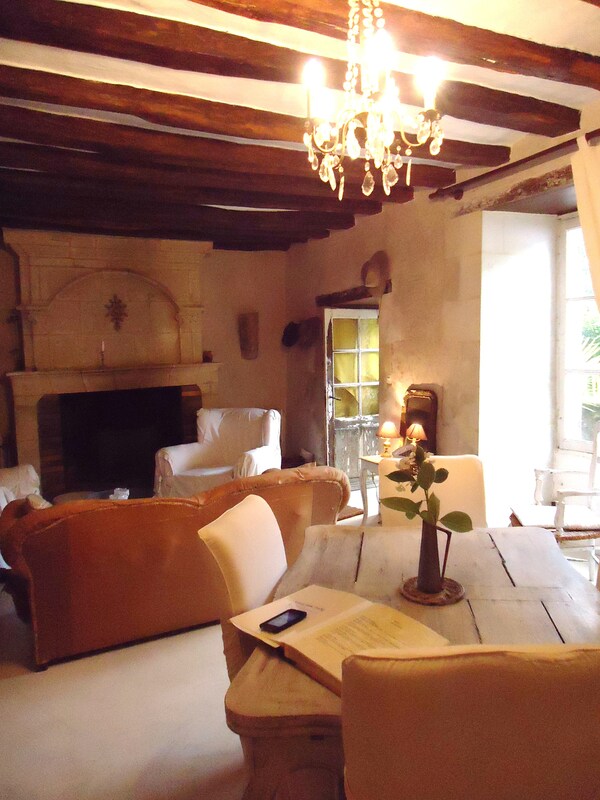 The old beams, fireplace and thick limestone walls are all so charming and French. 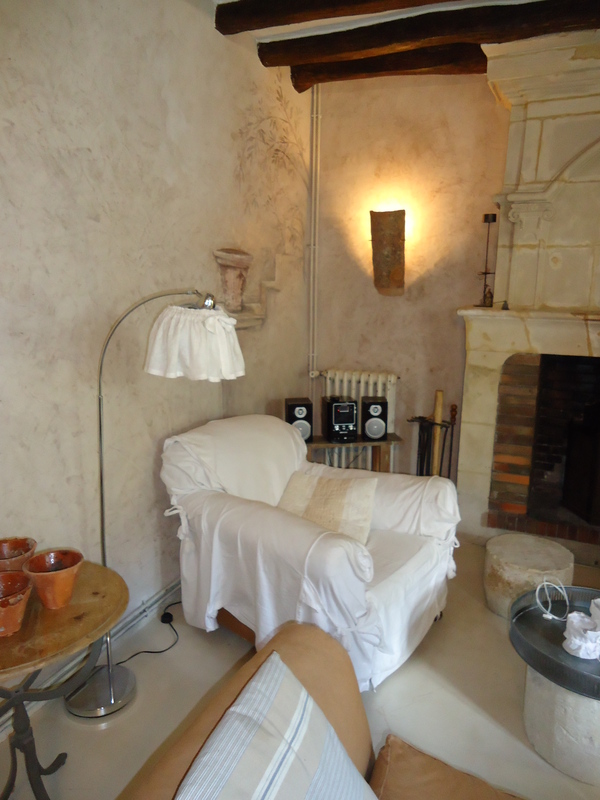 Love the juxtaposition of the very modern wall sconce with the trompe l’oeil in the corner and the limestone fireplace. Have a way too modern standing lamp? Disguise it with some gathered fabric! The French just seem to know how to do things right. The little coffee table is a round cement pedestal under a metal tray. 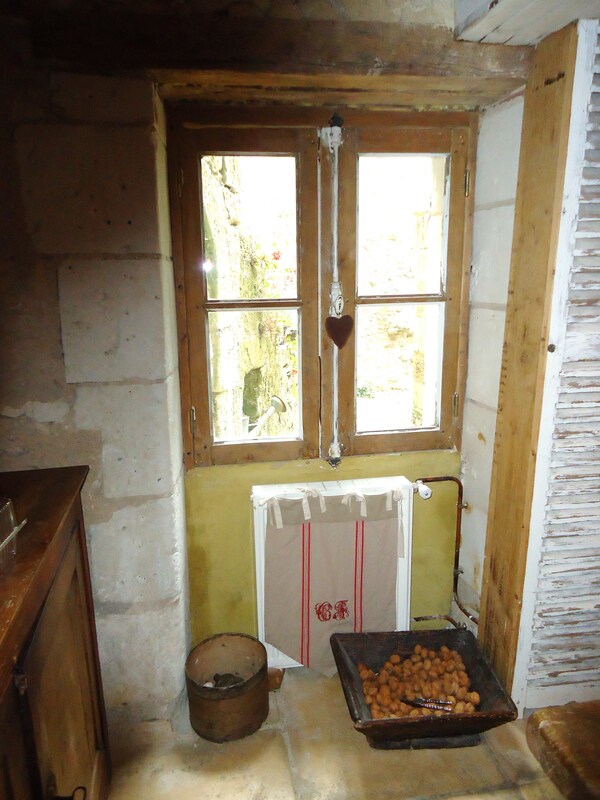 And the small ottomans—also cement pedestals—they are clever, the French. 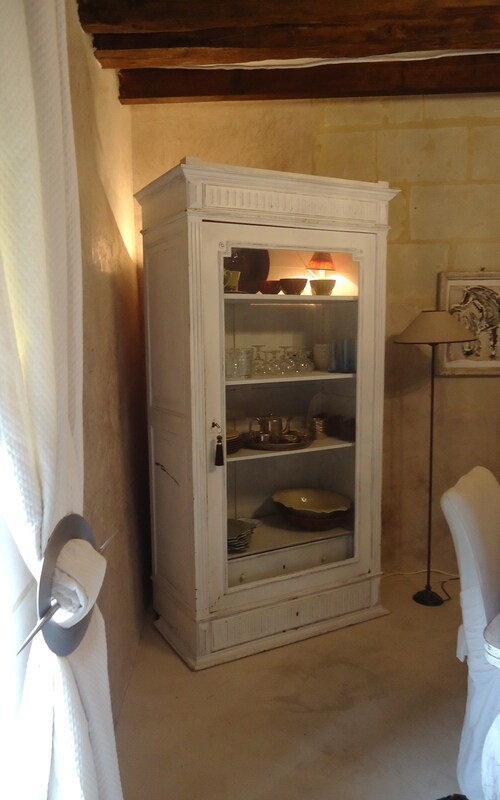 The old armoire turned china closet. I think the front panel was replaced with glass. The little light in the china closet is just darling. Love the tie back on the matelasse window treatment. Looks like a larger version of something I used to put on my pony tail back in the day. Nice old shutter with a sconce and white-washed dining room table. 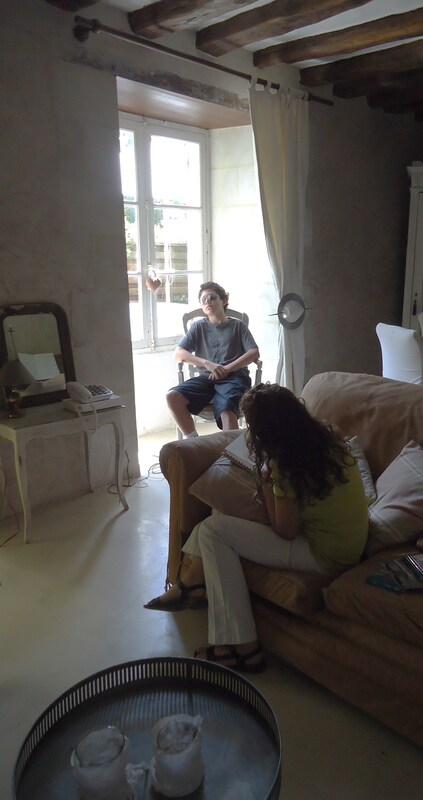 Since my kids had no TV (it was all in French), computer or texting, the piano came in handy. What a great window. 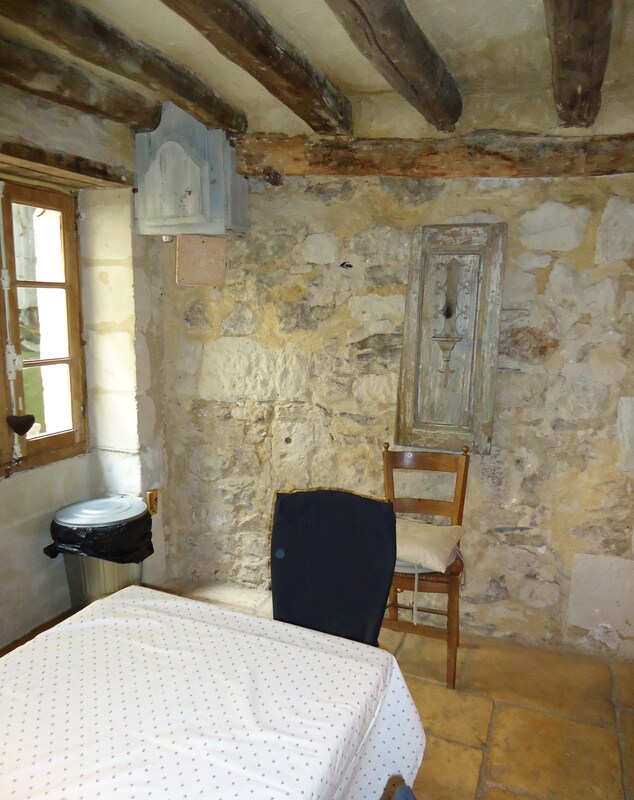 Notice the thick limestone wall. 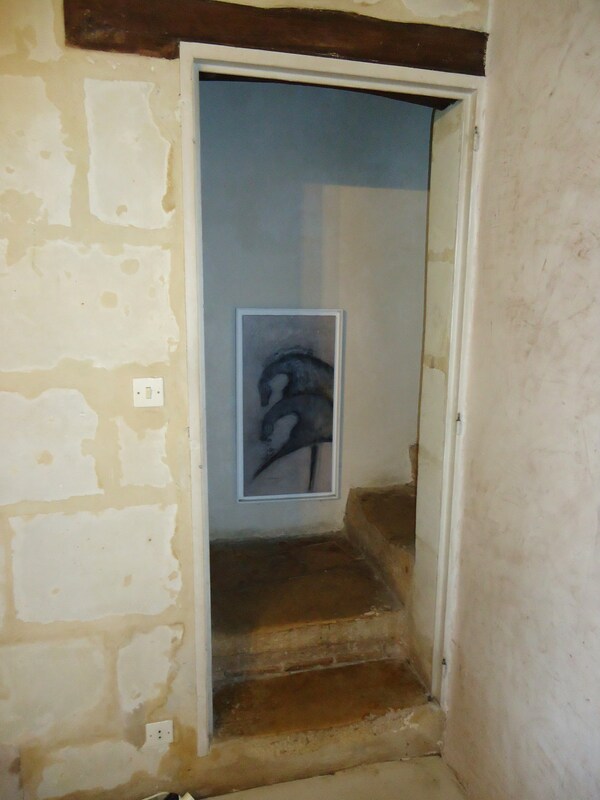 Yep, the painting looks fabulous hung so low above the landing. The steps to the right go up to the kitchen and to the left the steps go up to bedrooms on 3 levels. 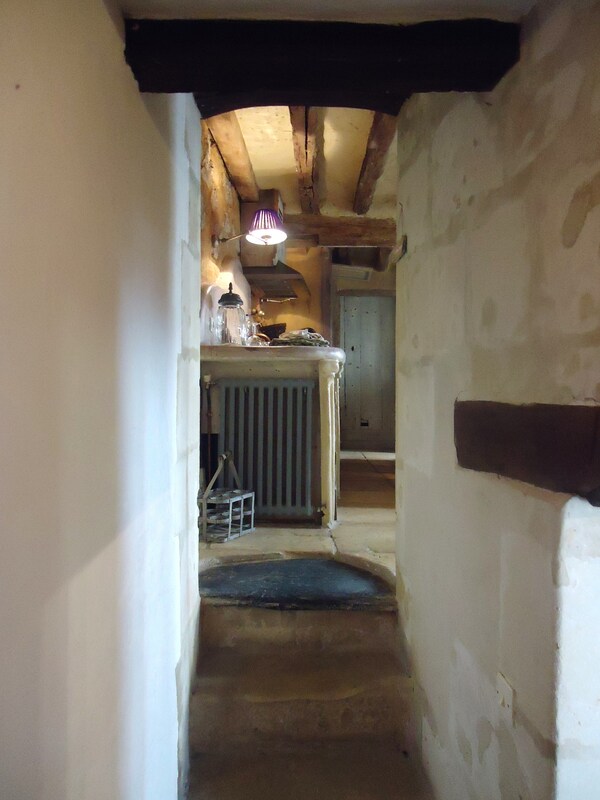 Stairs leading up to the enchanting kitchen. The counters are concrete. Love the big crystal knob on the lone overly distressed drawer. 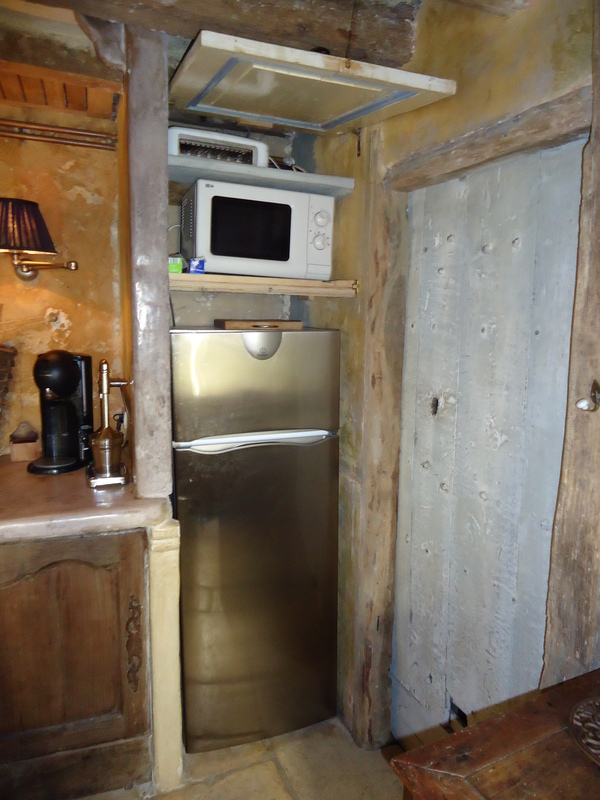 The door to the left of the sink hides the dishwasher and the door to the right of the range hides the washing machine. 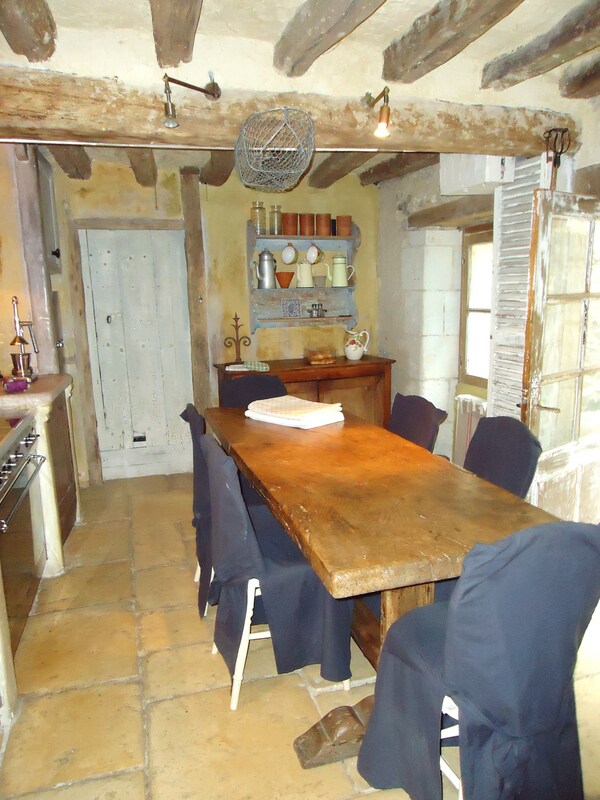 Swing arm wall lamps in an ancient kitchen? Who would have thunk! 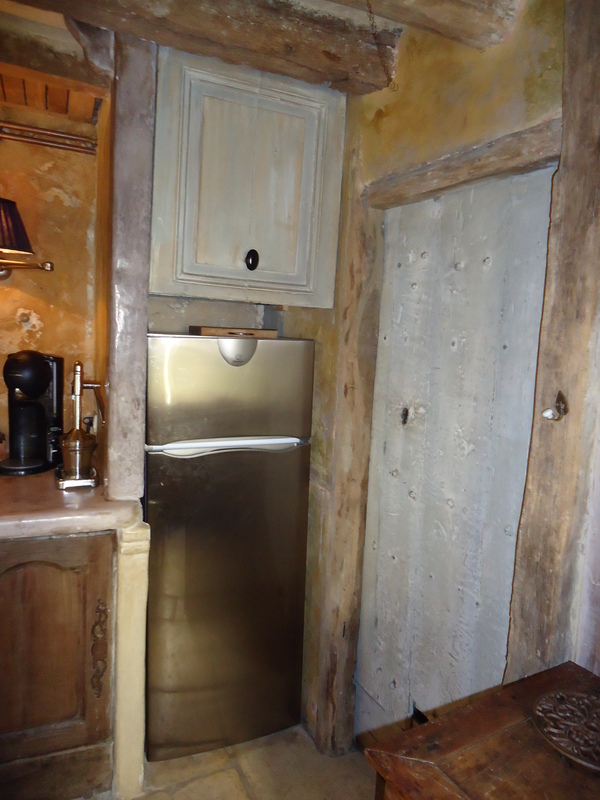 The old grey door slides to the right to expose a large pantry closet. 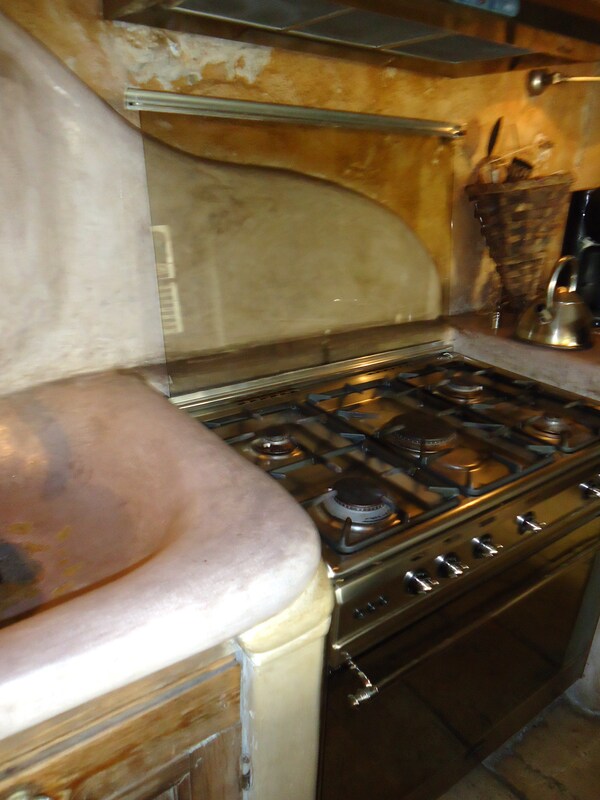 The cabinet on the back wall holds all of the dishes, glassware and pots and pans. 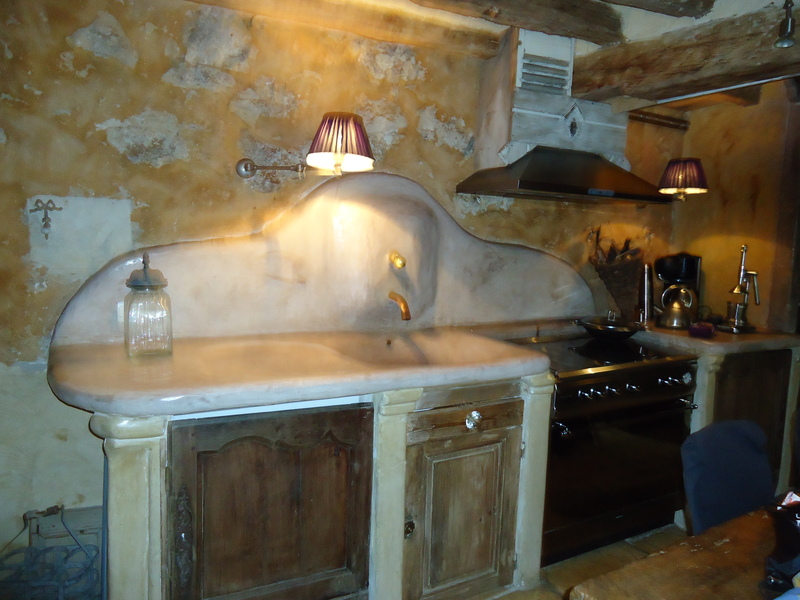 It is interesting how they combined modern lighting in this enchanting old kitchen. The shutter next to the door hides pipes. 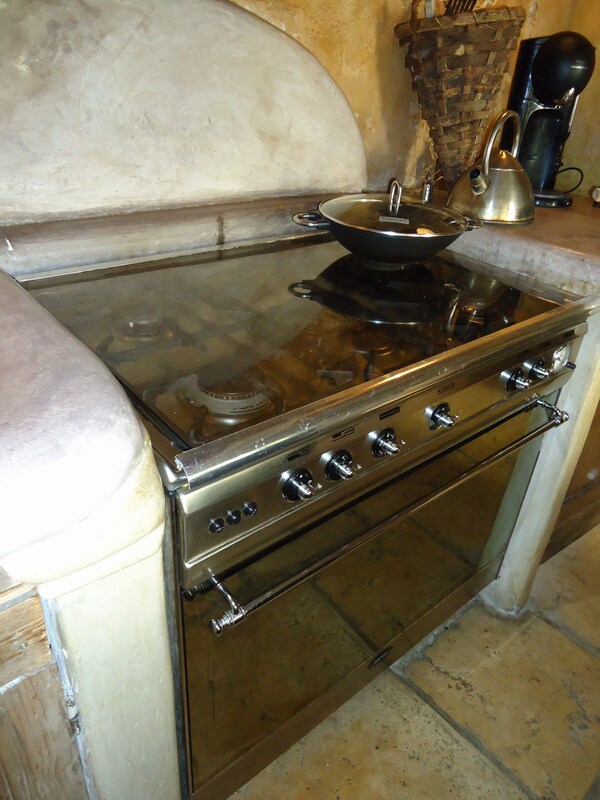 A glass lid on the gas range is hinged and raises to become a backsplash. Utterly ingenious. I need a new range so I have asked appliance stores if there is anything like this in the states and they just look at me like I have 3 heads. I could really use the extra counter in my too small kitchen. The monogrammed tea towel hides the radiator. There must be a walnut tree on the grounds! The wooden box at the ceiling hides the meter box. The old shutter is charming with the little country chair—you can even see the scorch mark left by the candle. 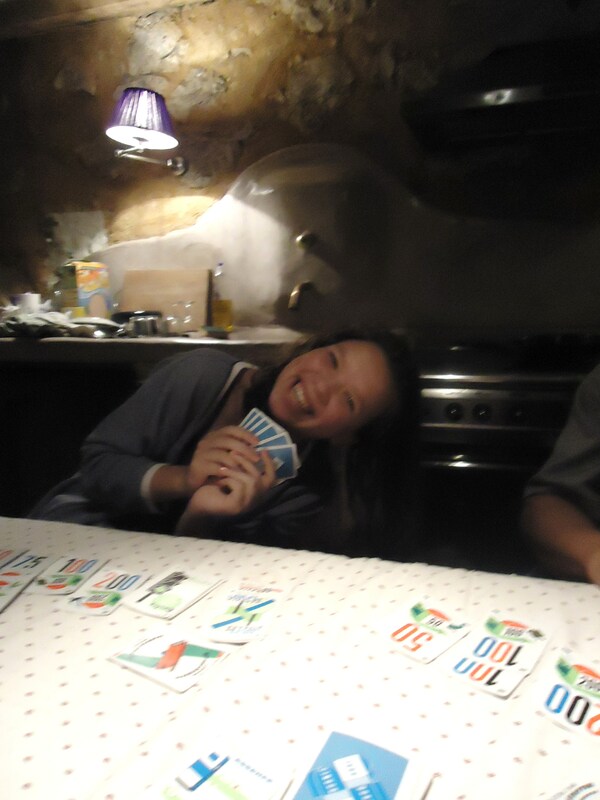 The kids playing Mille Bornes every night with me and IT Dave (without him there would be no blog! I made him President so he would stay on. People like titles). 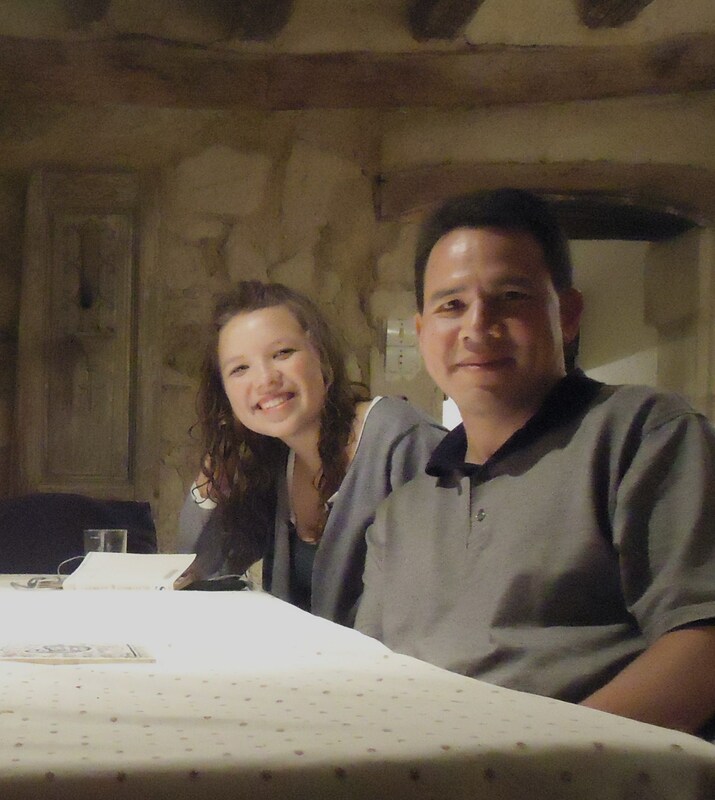 This is what families did before TV and technology…..It is all good! 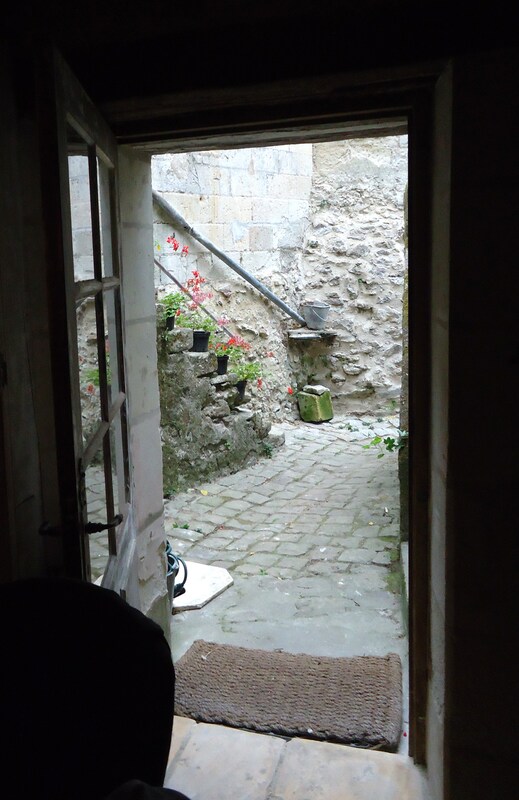 Looking out of the kitchen door onto the back courtyard. These steps go up to the kid’s bedrooms on the 2nd and 3rd levels. To the left you can see one of the church windows. I am surmising that the clergy used these steps in days gone by so that they did not have to go through the house. 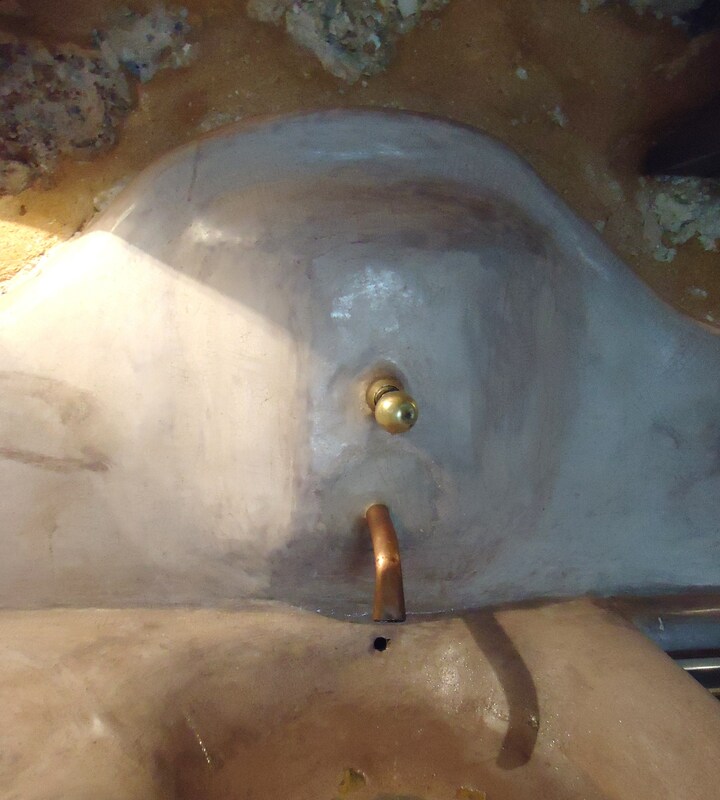 An old well outside the kitchen door. Even geraniums in plastic pots look charming in France! Oh, wow….how enchanting! 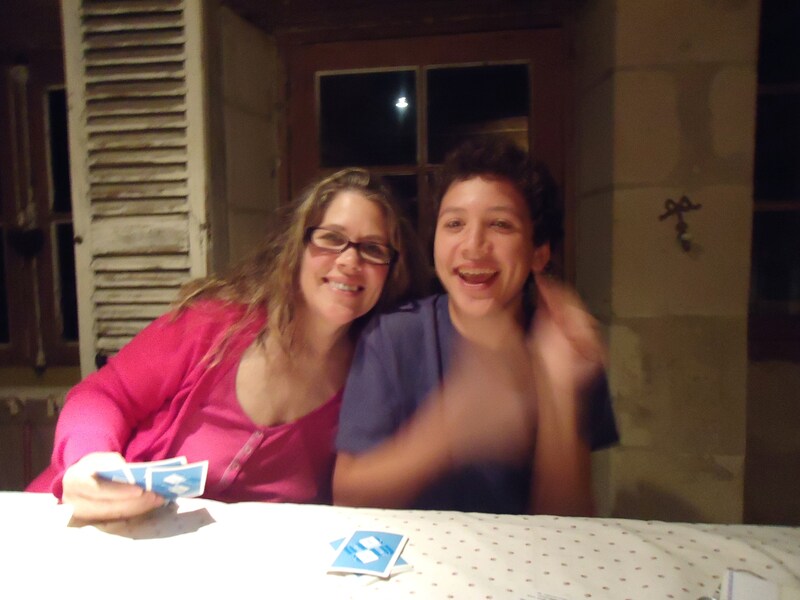 Little Milly was a great base for y’all while you explored the Loire Valley!!! Thanks so much for treating us to the tour, and I look forward to seeing the bedroom! Yes it is enchanting. Thanks for sharing Milly with us, she is so charming. How absolutely beautiful!! Thank you for sharing at Feathered Nest Friday! !